Looking for a quick and easy Easter dessert? Don’t worry — we have you covered! Whether you are a professional or a novice, these simple sugar cookies will totally fit the bill! 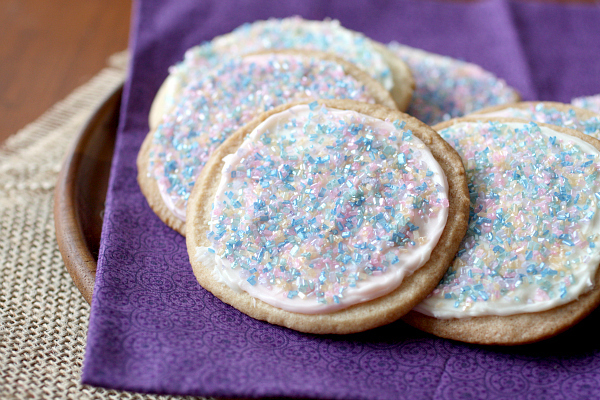 Who doesn’t love decorating sugar cookies on Easter? They can be intricate or simple… it’s your choice! However, the one thing you never want to see is a cookie stuck to the bottom of the sheet pan. This can instantly turn a good time into a bad time! Luckily, PAM Non-Stick Cooking Spray can save the day. Just give your pans a little spray and never worry about your cookies sticking again! We used a smooth and fluffy vanilla frosting that perfectly pairs with these no-chill almond sugar cookies. To decorate, we used perfectly sweet sanding sugar, but there are so many options for decorating — sprinkles, edible glitter, colored gel and even small candies. Just remember to have fun and involve the kids! Toppings: sprinkles, candies, food dye, etc. In a bowl of an electric mixer, add room-temperature butter and sugar. Beat for about five minutes until fluffy and light in color. Add in egg and almond extract, and mix until combined. In a medium-sized bowl, add all-purpose flour, white whole wheat flour, baking powder and salt. Whisk together until airy and mixed together. With the mixer on low, gently add the flour until it is all incorporated. Make sure to scrape down the sides and bottom. Once the dough is together, lay it out onto a lightly floured surface. If the dough is a little crumbly, simply knead together with your hands until it is formed. Lightly flour a rolling pin and roll out the dough. If it’s too sticky, simply add a little flour to firm it up. Roll out dough until it’s about 1/4-inch thick, and then dip cookie cutter in flour and cut out shapes. Spray a large cookie sheet or sheet pan with PAM Non-Stick Cooking Spray, and gently lay out cookies on sheet pan, leaving 2 inches between cookies. Bake for about eight minutes until lightly browned, and let cool completely before you start decorating. To decorate, simply spread frosting onto the cookies and decorate with desired sprinkles, candies, etc. In a large bowl of an electric mixer, add all ingredients and mix until fluffy and combined. If the frosting is too thick, add more milk. If it’s too thin, add a little more powdered sugar. If you wish to add coloring, simply split the frosting into several different bowls and add a few drops of coloring per bowl. Stir each bowl with a clean butter knife until color is mixed into the frosting.